After spending lots of time inside during the snowy or rainy months – you may want to update your rooms. I love to find new and easy ways to give my home a facelift. Just by adding a few new accents you can do just that. I like doing DIY projects and upcycling is the pefect way! 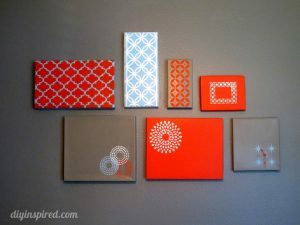 Shoebox Lid Wall Art – Use the lid of a shoebox as a paint canvas. Spray the lid with primer and then paint the lid in the color of choice. Use stencils to create unique artwork. Drawer Organization – Cut the bottoms of food boxes so they are approximately two and a half inches high. Wrap each bottom with decorative paper and use them inside drawers for organization. Use different-sized boxes to organize pencils, pens and paper clips. DIY Map Lampshade – Paper maps are great for upcycling home décor accents like lampshades. Cut the map to the desired shape and size, and use decoupage medium to cover the shade. 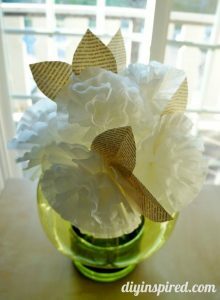 Coffee Filter Paper Flowers – Pinch the center of a coffee filter upwards to create a bunch. One by one, add three more until one full bunch has four coffee filters. Use a child-sized hair band to tie the “stem” together. Cut out flower petals out of old book pages and glue them to the flower, then use a dowel rod to create a sturdy stem. 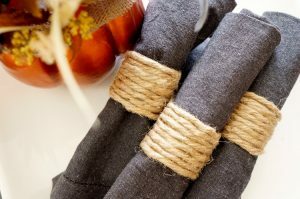 DIY Napkin Rings – Cardboard tubes should never be thrown away! Cut a tube into two-inch-thick pieces. Paint them your favorite color, then glue a shell or a flower on top for spring. These are projects you can in do in a short time and they will give your living space a lift. Most of these projects you can do in a couple of hours. You can find more great ideas from Dinah on her blog DIY Inspired.